Dr. Barta is highly experienced in complex restorative dentistry and cosmetic dentistry including porcelain veneers, multiple crowns , bridgework and endodontics and is passionate about improving the lives of patients through the creation of natural, healthy-looking smiles. Dr Erika Barta graduated from Semmelweis University Budapest in 2005. She moved to Dublin from the UK in 2008. She has been working at Crown Dental since the opening of the practice. 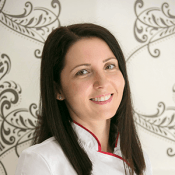 Her main interest is cosmetic dentistry, and she loves designing and creating great smiles for her patients. 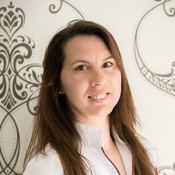 Erika practises all aspects of general dentistry, and has considerable experience in restorative (rebuilding) and cosmetic dentistry. Erika continually develops her knowledge with courses , she has received advanced training in Smile design and Short-Term Orthodontics. She adapts the most advanced techniques in dentistry using the best materials. She has had great success in treating nervous patients and building trusting relationships with those under her care. Erika has a calm and caring approach to her patients, and always tries to make the dental visit as pleasant as possible. Erika lives in Terenure and became an Irish citizen in 2015 . Outside the practice she enjoys sports, she is a member of the local gym, and enjoys running outdoors as well. She loves traveling and visiting new places, trying the local cuisine. 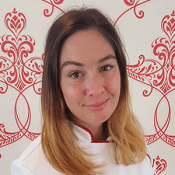 She has a passion for cooking and baking from healthy ingredients. When you meet Dr. Kluszka you will instantly see how she loves everything about being a dentist with a special interest in the field of orthodontics. Dr. Kluszka attended the University of Debrecen, Faculty of Dentistry and graduated in 2012. Dr. Kluszka received ample training in orthodontic treatments for children and adults, with the most modern and scientifically based principles in orthodontic technology. She also has experience as a general dentist so understands this aspect of dentistry as well. Laura is a caring person who loves to spend time chairside with her patients. She finds it rewarding to be able to help patients of all ages achieve and maintain beautiful, functional smiles. She believes that straight teeth are important for daily life, not only for the obvious aesthetic benefits, but also because straight teeth are healthier since they are easier to clean. Her philosophy of treatment emphasizes taking into account the effects of orthodontic treatment on the facial features, and utilizing her scientific knowledge as well as her artistic sense to design a wonderful smile for each patient, while providing excellent bite function. In her free time Laura loves the outdoors, likes traveling and going on excursions in the countryside. As an exercise she enjoys running.